Okay first of all I love Speakeasy bottles, but really who cares it's the beer that is important. This porter is smooth and easy to drink with a nice balance. The beer has a coffee chocolate smell, beautiful foamy almost cappuccino head and a small tiny tiny hop finish. At 7.5 % not bad. If you are ever in SF I would skip anchor and go to speakeasy, but beware it's only open on Friday from 4-9. Although this Porter is not their best they do have a solid IPA and imperial stout. 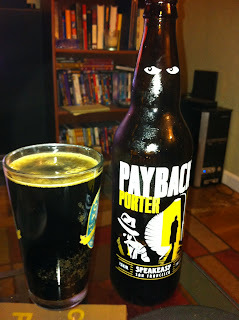 Brendan wasn't to impressed with this Porter and to be honest it's nothing special, but definitely worth a drink.